Grand Princess continued on to Hawaii Thursday night after concluding its search for the passenger who jumped overboard Wednesday afternoon. The woman’s body was never located. 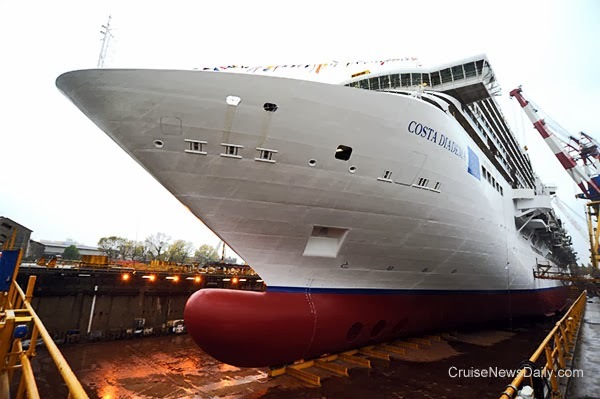 Fincantieri put water under the keel of Costa Diadema allowing the ship to float for the first time today at the company's Marghera yard (near Venice) today. The 132,500-gross ton vessel will be delivered on October 30, 2014. Deployment will initially be in the western Mediterranean during the winter 2014-2015 season. Just before the valve is turned and water pours into the dry dock. 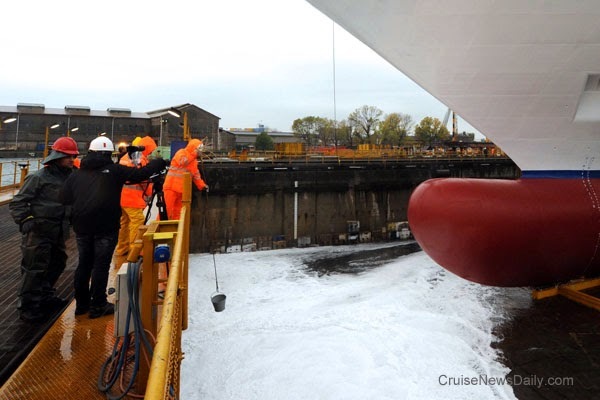 The first water pours into the dry dock. Filling the dry dock takes almost a day. The ship will then be towed to a finishing dock. 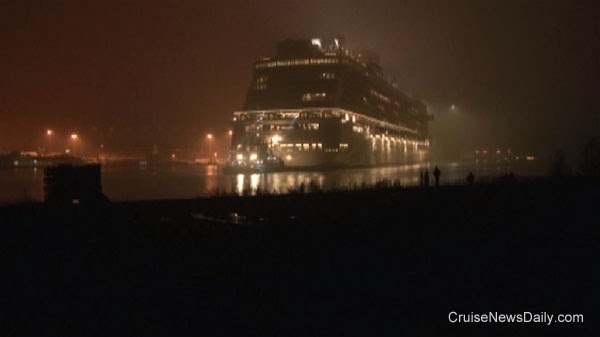 Norwegian Getaway departed Meyer Werft in Papenburg early this morning (November 15, 2015) at about 1am (local time) amidst cold and fog, causing the ship to quickly become invisible. The fog persisted through its entire river conveyance, sometimes making it impossible to see the ship from the shore. Norwegian Getaway passing the dam at Meyer Werft taking the ship into the river. Norwegian Getaway at Weener. 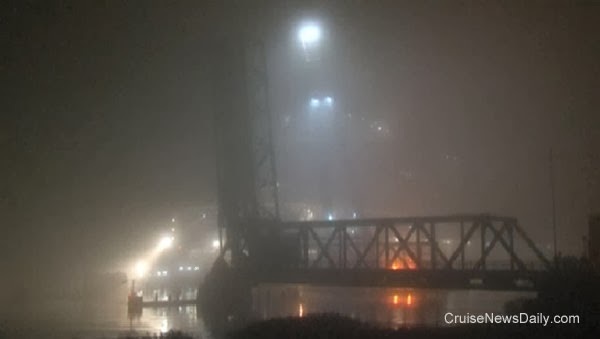 The heavy fog like this obscured the ship through its complete river conveyance. When the sun rose, the visibility did not increase. 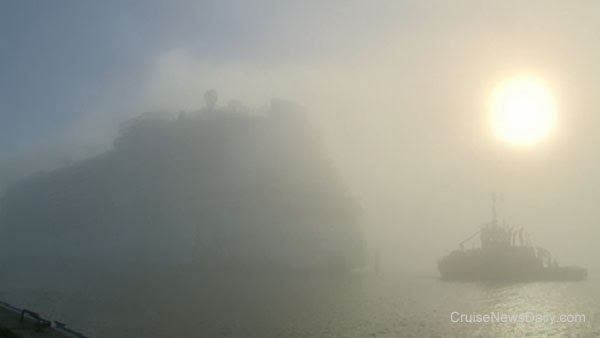 Norwegian Getaway nearing Emden Friday afternoon in the fog. Photos copyright Michael Wessells and Meyer Werft. May not be copied or used without permission. Ten days ago we told subscribers that Royal Caribbean’s Allure of the Seas was experiencing propulsion problems which had necessitated sailing slower on its eastern Caribbean itinerary while company management considered how to fix the problem. 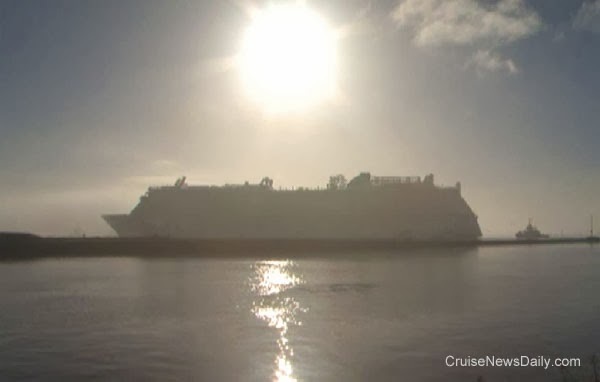 Grand Princess continued to search today for the passenger who was seen jumping overboard yesterday while the ship was en route from San Francisco to Hawaii. The incident occurred on Day 3 of the cruise when Grand Princess was 750 miles northeast from Hilo. The remote location is making the search extremely difficult. CND subscribers also read about Carnival being "two" perfect ... and more ships mean more office space. Updated 5:46pm - Royal Caribbean International announced that Allure of the Seas would be taken out of service for a week to perform repairs on the propulsion system, resulting in the cancellation of the February 23, 2014 sailing. The repairs will be performed at the Grand Bahama Shipyard in Freeport. The propulsion problem has manifested itself in the ship having to sail at reduced speeds over the last several weeks on its eastern Caribbean itinerary. (The weeks it sails to the western Caribbean are unaffected because of shorter distances.) On those weeks, the itinerary is modified to reduce port times in Nassau and St. Thomas, thus giving the ship more sailing time to cover the distances. Allure of the Seas will continue to operate that modified itinerary on sailings to the eastern Caribbean through February when it will be repaired. Passengers booked on the canceled February 23 sailing will receive a full refund or the option to sail on select itineraries at the same rate. Complete details will be in today's issue of Cruise News Daily. In less than a week MSC Divina will arrive at her new year round home port in Miami, and already, MSC has opened her winter 2014-2015 program for sale. A passenger was witnessed intentionally jumping overboard from Grand Princess this afternoon as the ship sailed from San Francisco to Hawaii, and at the time of publication, the ship is still searching for her. MIAMI (November 12, 2013) – Carnival Corporation & plc (NYSE/LSE: CCL; NYSE: CUK) and the Miami HEAT today announced that Carnival Corporation & plc, its 10 cruise brands and the Carnival Foundation will team up with the two-time defending NBA Champion Miami HEAT in making a pledge to donate at least $1 million to support relief efforts in communities affected by Typhoon Haiyan in the Philippines. Miami HEAT owner Micky Arison is also the chairman of Carnival Corporation & plc. "We would like to extend our condolences to the victims in the Philippines, an area I hold close to my heart and have visited four times in the last five years,” said Miami HEAT Head Coach Erik Spoelstra, a Filipino American. “It is vitally important that we do everything possible to help those impacted by this tragedy. My thanks and appreciation to Carnival, Micky Arison and the entire Miami HEAT organization. We value the many fans that we have over there, and we will keep them in our thoughts and prayers." In addition to pledges, each of Carnival Corporation & plc’s brands and its employees will continue to support the ongoing relief efforts through local fundraising and other aid initiatives. Together, these brands operate 102 ships totaling 209,000 lower berths with eight new ships scheduled to be delivered between spring 2014 and fall 2016. Carnival Corporation & plc also operates Holland America Princess Alaska Tours, the leading tour company in Alaska and the Canadian Yukon. Traded on both the New York and London Stock Exchanges, Carnival Corporation & plc is the only group in the world to be included in both the S&P 500 and the FTSE 100 indices. Disney Cruise Line released their early 2015 deployment plan today, and for the second year in a row, they will have their entire four-ship fleet homeported in Florida for the winter season, with three of the ships at Port Canaveral. Disney Wonder will again be based at Miami. 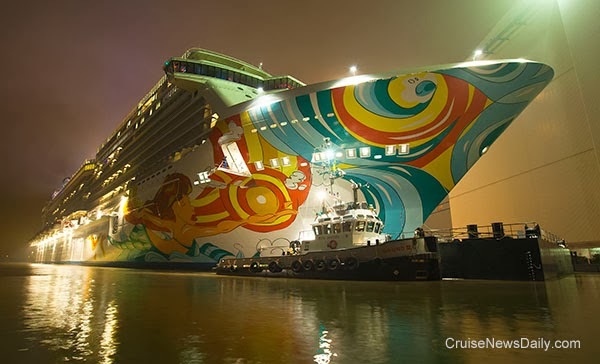 Meyer Werft said today that they have scheduled Norwegian Getaway’s river conveyance from the yard in Papenburg down the Ems River to the North Sea for this Thursday. This is the slow methodical voyage - backwards - down the relatively shallow river through its various narrow passages. As the largest class of ship Meyer has built so far, things will be even more slow and careful than ever. Cunard is already planning its 175th anniversary in 2015. It’s never too early to start. Their celebration is going center on their previous home of Liverpool with two events. In this video, Kelly Gonzalez, Royal Caribbean's VP of Architectural Design, and Harri Kulovaara, RCCL's EVP of Maritime & Newbuilding, take viewers behind the scenes at Meyer Werft to demonstrate the yard's virtual reality and 3D modeling of Quantum of the Seas. The model lets designers walk through the ship before it's built so they can see how the ship will look and people will be able to flow through it. By being able to see it in this way at this point, they can make changes to this ship instead of having to wait to a later one in the series. Not only that, but the executives all get to show their geeky side in those kewl glasses. Video courtesy of Royal Caribbean Cruises Ltd.
Four men were arrested aboard the wreck of Costa Concordia early Friday morning for allegedly picking up items for souvenirs. All four were employees of the salvage company. Last Friday night as Dawn Princess was sailing between Wellington and Napier (NZ) it experienced a fire in an electrical substation on Deck 6 sending passengers to their muster stations for approximately an hour. There were no injuries to passengers or crew members, and the ship returned to normal operation. CND subscribers also read about customers returning to a parking lot to pick up their cars after their cruises only to be locked ... Norwegians going Wii, Wii, Wii all the way home ... and Mission Accomplished in Turku (more). 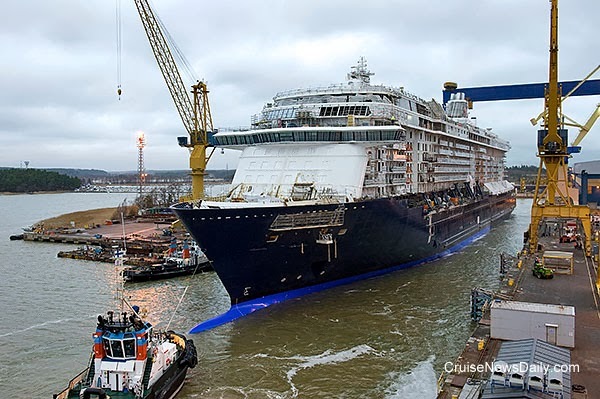 After beginning to floating the ship up on Friday afternoon (November 8, 2013), the dry dock continued flooding overnight, and Saturday three tugs towed TUI's Mein Schiff 3 to the finishing dock at the STX Finland yard in Turku (Finland) where it will remain over the next six months while it is completed. The 99,700 gross ton ship is slated for delivery May 2014. Here, after the gates to the dry dock are opened, Mein Schiff 3 is towed out by a single tug and assisted by two others (to control the ship since it has no power at this point). The ship's main engines won't be started for the first time until January. 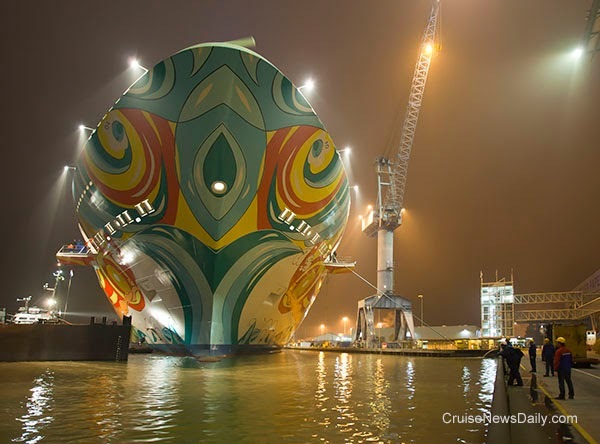 Work will continue on Mein Schiff 3 at the finishing dock until it is delivered in May 2014. The ship is shown here Saturday afternoon. 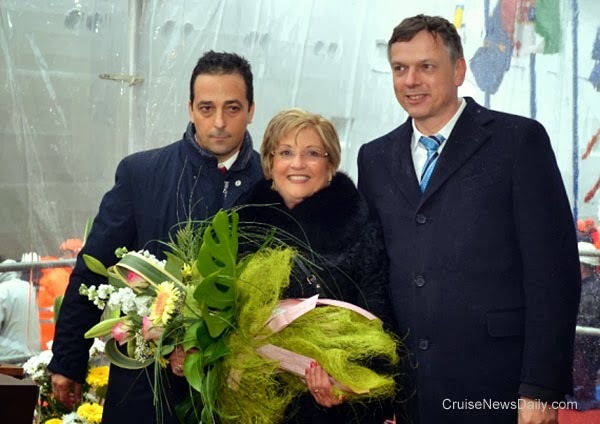 Photos courtesy of TUI Cruises and STX Finland. Copyright TUI Cruises, STX Finland and Cruise News Daily. May not be copied or reproduced without permission. All rights reserved.